TOKYO, Feb, 27 2019 - (JCN Newswire) - Sony Global Education, Inc., Fujitsu Limited, and Fujitsu Research Institute announced that as of February 27, they have initiated a field trial to evaluate the usefulness of blockchain technology(1) in the management of course records and grade data. The trial will be conducted in collaboration with Human Academy Co., Ltd., an educational institution that accepts and teaches foreign students. In this field trial, students who hope to study abroad in Japan will take a course (Nihongo Dojo) aimed at the Nihongo Kentei language proficiency test created by EDVEC Inc. Students enrolled in the course will make use of Fujitsu's Fisdom(2) digital learning platform, and the learning data of each student, including study logs and grade information, will be stored and managed as unfalsifiable data on a blockchain, in the form of a certificate. Educational institutions will be afforded a firm grasp of the prospective student's language ability by referring to the highly reliable learning data stored in the blockchain when checking the validity of the educational certificate submitted by the prospective student. The implementation of this system will make it possible for learning institutions to support diverse ways of learning more effectively. The three companies will also consider an initiative to evaluate learning attitudes and processes through a more multifaceted analysis of the study logs and grade information collected during the trial. In recent years, Japan has played host to an increasing number of foreign workers and students. At the same time, the country has witnessed a trend toward greater diversity, and a push toward acceptance of a wide variety of people with respect for individuality. With the implementation of the revised Immigration Control Act in April of 2019, it is anticipated that the number of foreign workers entering Japan will grow even further. Under Japan's proposed foreign guest workers' program, workers and students submit the results of Japanese classes and tests taken before coming to Japan to their educational institutions or employers. In the past, however, there have been cases when educational institutions have had difficulty confirming the validity of foreign students' course results. In terms of language ability, this has led to issues as appropriate instruction suited to a person's ability was not provided after coming to Japan, and the institution was subsequently unable to offer job search support. In order to resolve these sorts of issues, Sony Global Education, Fujitsu, and Fujitsu Research Institute will embark on a multi-stage trial, beginning with prospective exchange students taking the Nihongo Dojo course, which prepares students for the Nihongo Kentei test. The Nihongo Dojo course was developed on Fisdom, Fujitsu's digital learning platform, and under the new trial, students' course data will be managed on a blockchain, which Human Academy will use to verify their learning credentials. Collaborating Educational Institution: Human Academy Co., Ltd. In this field trial, a blockchain will be used to compare the contents of educational certificates submitted by prospective exchange students to the learning data stored on the blockchain, including course records and grades. Prospective foreign students will be asked to take the Nihongo Dojo course, a course from EDVEC aimed at supporting students in obtaining Nihongo Kentei Japanese language qualifications, through the Fisdom online course platform provided by Fujitsu in advance of their study abroad program. The course platform will collect data including test scores, Japanese conversational ability, and study time, and store them on a blockchain as a certificate. 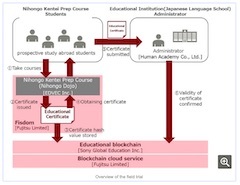 Human Academy, as the educational institution that will accept and teach these foreign students, will be able to accurately grasp the language ability of individual students based on this highly reliable data, by comparing the certificate data on the blockchain with the educational certificates submitted by the prospective students, making it possible to support them with appropriate education suited to their individual skill levels after coming to Japan. In addition to cooperating to promote this field trial, going forward the three organizations will also consider an initiative to evaluate not only the study results of foreign workers and prospective exchange students, but also their study processes and attitudes toward learning, through a more multifaceted analysis of collected study logs and grade information. In addition, with this new field trial, Fujitsu will promote the utilization of blockchain throughout the educational field, and aims for a future society in which data associated with an individual's learning can be utilized safely and securely beyond the framework of companies and educational institutions. (1) Blockchain technology The blockchain cloud service Fujitsu is providing to Sony Global Education will use Hyperledger Fabric as its platform. Hyperledger Fabric is a blockchain framework, part of the Hyperledger Project operated by the Linux Foundation. Hyperledger is an open source collaborative effort created to advance cross-industry blockchain technologies, and Fujitsu is one of the Premier Members of Hyperledger. (2) Fisdom A SaaS online learning platform provided by Fujitsu, officially approved by the Japan Massive Open Online Courses Promotion Council.